A Kilsyth police officer who worked and lived in Cumbernauld is currently behind bars and awaiting a jail sentence for domestic violence. Detective Constable Steven Riding (46), who served 24 years as a policeman, was found guilty at Airdrie Sheriff Court this week after an eight day trial. The former drugs squad officer is currently suspended by Police Scotland. 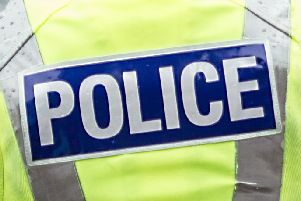 Riding, who served in Cumbernauld until 2014 as a uniformed and later plainclothes officer, has been signed off since allegations were first made over two years ago, citing anxiety and depression. Riding, who had no previous convictions, showed no emotion in the dock as the foreman of the jury delivered fifteen verdicts, nine of which were agreed unanimously. It took the seven men and eight women just over an hour to convict him of offences spanning almost 22 years between September 1, 1992 and April 23, 2014. Two other charges were dropped before and during the trial. Riding, of Glen Garrell Place in Kilsyth. was remanded in custody after Sheriff Morag Galbraith withdrew his bail. Riding and Susan met at the club night in Kilsyth Pentecostal Church when he was just 17 years old. Riding also physically abused Susan while they lived at a house in Hazel Road, Banknock. She then told of the series of assaults and beatings she took from Riding during their seven year marriage, during which time they lived at three separate addresses in Cumbernauld and Bishopbriggs. “There was one time he punched me three times to one arm,” Lorna said. ” I had heard that in his previous marriage his wife refused to pay utility bills. He went through my handbag and found a utility bill reminder. That was why he assaulted me. I was in great pain. “When I went upstairs sitting on the bed asking me not to put him through that again. I had seen the expression on his face before and was fearful. Lorna went to the professional standards unit at Strathclyde Police Pitt Street HQ. “They told me they weren’t the moral police,” added his second wife, who went on to carry out civilian roles within the police Family Protection Unit, Force Intelligence and Special Operations, during her 12 years service. He met his third victim Samantha Lindsay, on an Internet site connected to biking. She was his partner, but never married to Riding. Samatha also had a love of horses and worked in nearby stables. The attacks on Samantha took place at their home in Auchinvole Crescent, Kilsyth. She gave evidence behind screens, to avoid being able to see the thug cop sitting in the dock, said: “He whacked me across the face five or six times on one occasion. My head shook. It was always over arguments over money. Once I had a riding hat on when he hit me and my head still shook. “I was confused and didn’t know what to do. I felt vulnerable, after all, he was a policeman and was untouchable. My mind was all over the place. I was trembling, scared and almost like a rabbit caught in the headlights. She sent a text to Riding’s sister Elaine Adoo, 44, who lives in Antrim, Northern Ireland, saying “help, he’s at it again.” The couple had no further contact since April 2014, after all three women gave statements to police and Riding was arrested and charged. Questioned by defence counsel Niall McCluskey, Riding, who spent six years in the high profile Scottish Drug Enforcement Agency, claimed his first wife Susan kept a kitchen knife under a pillow. In another question by his counsel he couldn’t even remember the name of a woman from Cumbria he had a relationship with for nine months after separating from his second wife. He had to be reminded her name was Julia Wilson. The sheriff called for a Criminal Justice Social Work Report.